When a storm rocks your soul, what do you do? Hit the panic button or start to recall the promises of God? Listen to this lesson to learn that all of us will be hit with unexpected disasters and frightening experiences from time to time. See that what matters is how we handle them. Learn about three areas of application we can use, including God's essence, His grace, and the faith-rest drill. See how Jesus rebuked the disciples when they were frightened out of their wits during the storm on the Sea of Galilee. Understand how we can rely on Him calming the storm in our soul when we trust in Him. Fearsome, naked wild men that are too strong to be chained. Two thousand pigs rushing off a cliff. A crowd begging Jesus to leave. Listen to this lesson to see that all of these are connected when Jesus uses His authority to cast out demons and allows them to take up residence in pigs. See why the demons asked if Jesus was going to torment them before the right time. Understand the differences between demon influence and demon possession. See if there is a passage of Scripture that tells how to know if someone is demon possessed. Learn why Christians need not fear demon possession but need to avoid demon influence by letting their thinking be overhauled by the Word of God. What if someone could read your thoughts? Even when you're thinking something bad about them? This is what happened to the scribes when Jesus told a paralytic man that his sins were forgiven. Listen to this lesson to see that the scribes were shocked and were mentally accusing Jesus of blaspheming. See how Jesus showed them that He had the power to forgive sins and also to heal, revealing that He was God. See the significance of the title, Son of Man. Learn about four types of forgiveness and that all sin is basically against God. Decide to forgive others who have wronged you just as God graciously forgives your sins. Can you imagine laughing at the Creator of the universe? Listen to this lesson to learn about a weeping, disorderly crowd who didn't share the faith of a 12-year old girl's father who begged Jesus to heal his daughter. See how Jesus demonstrated His power by restoring life to this girl. Find out about a suffering woman who was commended by Jesus for her faith, even though she was ritually unclean. Understand from these two events that when Jesus came into contact with that which would defile Him, He remained sinless. Appreciate that when we believe in Christ, He gives us new life and eternal security. "Come on, shouldn't we just go along to get along? What harm does that do?" What happens in a culture when people can no longer see the difference between what is evil and what is good? Listen to this lesson to learn that Biblical values need to be firmly adhered to even in the face of negative consequences. See how Jesus restored sight to two blind men and speech to a man possessed by a dumb demon. Understand that these miracles are unique to the Messiah and demonstrated Jesus' credentials as God. Learn about seven "Son of" titles that relate to Jesus. Understand that Jesus saw the crowds of people as sheep without a Shepherd and He sends out a call for disciples. Have dinner with a bunch of low-class losers? Not on your life! Listen to this lesson to learn how Jesus calls a hated tax collector to be His disciple. See how this upsets the religious crowd and hear Jesus' grace-oriented answer to them. Learn that all believers are called to be disciples and it may involve uncomfortable changes in our life. Evaluate what kind of disciple you want to be and what kind you are now based on your priorities. The King has come! 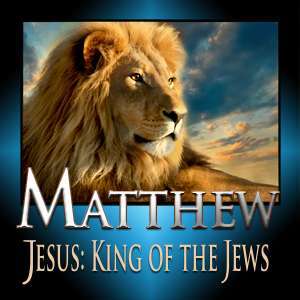 Accept him as your Messiah and He will establish His kingdom on earth! Listen to this lesson to learn that when Jesus was on earth He offered His Kingdom to the Jews but the religious leaders rejected Him as their Messiah. Hear about the 12 men first called disciples and later apostles who were sent out to proclaim His message. Understand the deep compassion Jesus felt, showing His mercy and grace for the undeserving. Accept that this grace is extended to all of us. "Bah Bah Bah". We are all like little sheep who have lost our way. Listen to this lesson to learn about Jesus' compassion for the Jewish people, the lost sheep of the House of Israel. Learn how He sent out His twelve disciples to teach them and find out why He told the disciples not to go to the Samaritans. Master five questions to ask when interpreting Scripture which explain some seeming contradictions. See that we are to be free from cares and anxieties and thoughtful in our response to those who attack us for what we believe. Hated? Dragged into court? Our own families turned against us? Listen to this lesson to hear how Jesus warned his twelve disciples that they would face persecution. Learn the difference between the Gospel of the Kingdom and the Gospel of the Cross. Understand what ''he who endures to the end will be saved'' means. Even though this was directed to Jesus' disciples and those in the future Tribulation, understand that during the Church Age we will face opposition and that Jesus promises never to leave us or forsake us. Click here to listen to or view this Bible class. If someone is hurling insults at you, what should you do? Listen to this lesson to learn that Jesus warned His disciples they shouldn't react in fear when someone insults and persecutes them for believing in Him. Sure, insults and persecution cause us to become afraid, but we need to understand that while fear is a natural reaction, we can make a conscious decision to trust God. See a number of reasons that show how much our Heavenly Father knows and cares for us. Apply this commandment not to fear to your own circumstances so you will not be ruled by the fear factor.